With over 30 years of experience, our locksmiths specialize in business security measures that are effective. Great Valley Lockshop can handle all of your commercial security needs, from minor repairs to a complete overhaul and upgrade of your security system. For information about the best ways to protect your business, come to the experts first. With a full line of commercial security products from the industry’s top manufacturers, we’ll protect your business quickly and securely. We guarantee prompt, friendly, affordable service for every business in the area. With the help of the latest security technology, Great Valley Lockshop can quickly code cut keys, engrave cylinders and keys, and generate master key systems. Our professional-grade equipment enables our technicians to accurately and quickly re-key any lock brand. When a lock is rekeyed, the mechanical locking mechanism is changed to ensure that previous keys will no longer work to open the lock. The lock is then reset to open with a completely different key. 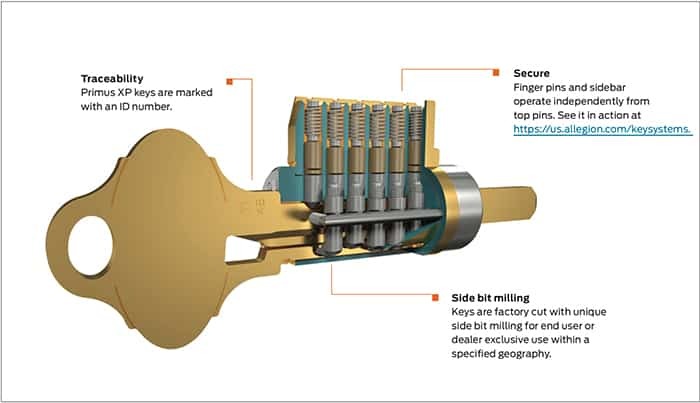 During a rekey, no hardware is replaced, as the only the internal component of the lock that rejects or accepts the key is modified. If you’re looking for a cost-effective way to change keys on any rental or business property, call us first. Master key experts at Great Valley Lockshop will work with you to design key systems that match your current hardware. We can customize your plan to meet your company’s specific needs. Master key systems can quickly be integrated with any electronic hardware, even with audit trail capabilities. We don’t consider any job too big or too small. Our technicians have worked with medical centers, office buildings and universities to create secure, safe buildings. Regardless of the size of your business or facility, we guarantee that we can help with all your lock and key needs. When you need a commercial re-key or are concerned about the safety of your building and employees, come to the professionals that take every job personally.